Frederick Bruton was born in Malvern, the son of Edward Bruton, a hairdresser and Mrs Bruton of South View, Court Road. 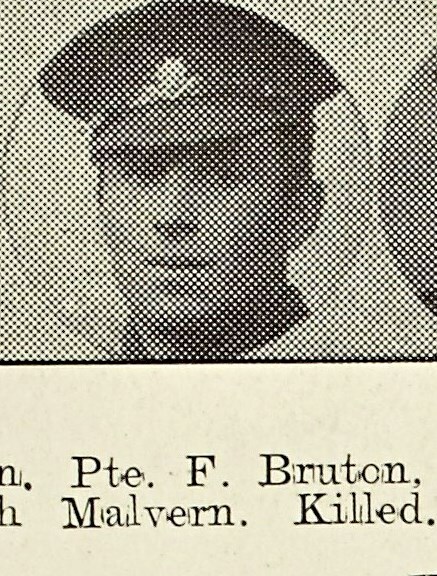 In April 1917, they received information that their son Pte Frederick Bruton who joined the Malvern Chums Company in September 1914 had been killed in France. Before the war he was employed at the Worcestershire Golf Club and was a prolific sportsman – he played cricket for Malvern Town Club and the College Servants, and was a member of St Andrew’s Football Club and Malvern Workingmen’s Golf Club.